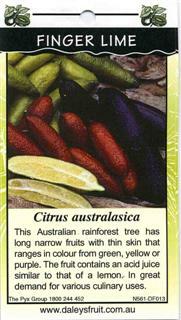 ﻿This Australian rainforest tree has long narrow fruits with thin skin that ranges in colour from green, yellow or purple. The fruit contains an acid juice similar to that of a lemon. In great demand for various culinary uses.